Dorrigo has an annual charity auction for the local RSL club. 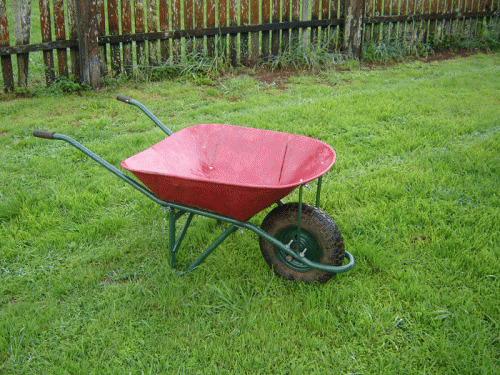 People bring lots of junk from their sheds and other unused odds and ends. From farm equipment to wardrobes, anything and everything can be found. I went along and had a great time amongst farm men and hippies. I bailed out of a contest for a old kids scooter. I dropped out of a lawnmower at $90 to see it go at $100. I did however win the above beauty for $30. 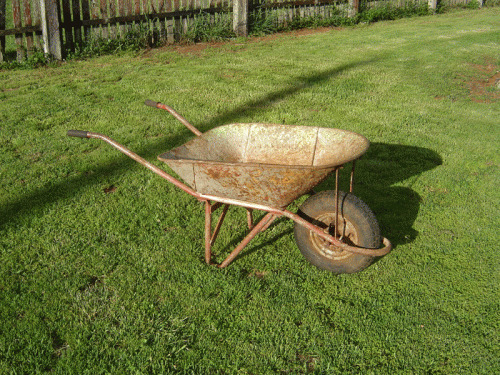 It is an old kelso with a great solid structure and only surface rust. Step 1 was to take it apart as shown above. Some bolts holding the barrow onto the frame required some angle grinding to get them off, others came away with some brute force. I then took to it with a wire brush. Just to get rid of any rust and to rough it up to hold some paint. I wasn't too fussed about the finish. Next step was the painting. This was a lot of fun, something I haven't done since I was a kid. I first did everything with a killrust spray can. 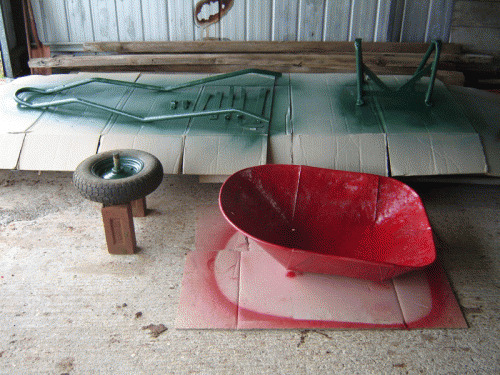 Then I got some cheap red and green spraypaint. The finished result you can see above. I ended up doing two coats after the killrust coat. Be aware of how your nozzle is shaped before starting on the real thing. Spray a test area of cardboard and see how it comes out. I wore gloves the second time as my index finger got coated. As the can advises is how you end up doing it, 20-30 centimetres, even coats. Bolting it back together. I got some new galvanised bolts for the final stage. The bolts went in fine, maybe a few were a bit long. I reused the rubber handles. I did not strip the wheel and grease the bearings as it was still turning okay when I bought it. Maybe a job for later, if I can get into it. 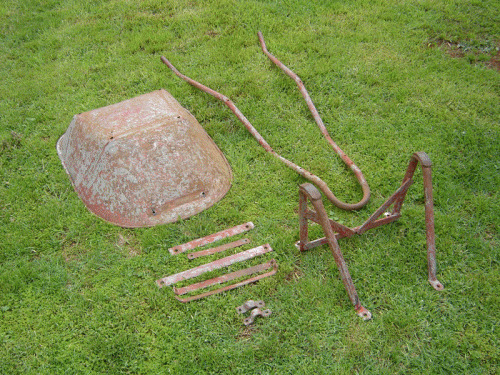 So all up about $50 for sturdy kelso barrow. Not to mention the small smile I get each time I see it or pick up the handles. No comments yet for this blog, be the first, submit your comment below.